Boles CA, Martin DF. 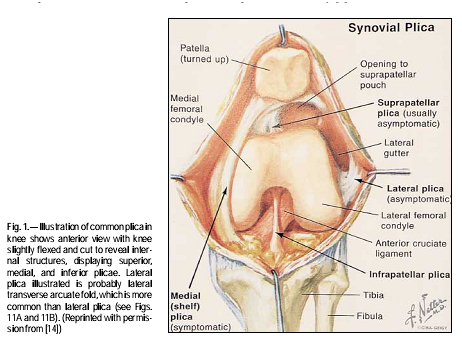 Pictorial essay: synovial plicae in the Knee. Amer Jour Roentgenology. 2001; 177)1):221-227. Plicae are synovial folds structured around the superior, inferior, and medial aspects of the knee joint (Figure 1). The plicae originates proximally with the genu articularis muscle and runs along the medial femoral condyle to insert on the intra-articular synovial lining of the knee. In some instances, there is a lateral plica, but it is more common to find the lateral transverse arcuate fold in place of the lateral plica. In a study by Boles et al, examination of 200 cadavers suggests that not all individuals develop plicae around the knee--10% had no presence of any plicae. In addition, an arthroscopy of the superior, inferior, and medial plica is frequently observed, but their location and size are inconsistent. Another study by Griffith et al proposed that plicae is present in everyone, but it is more prominent in certain individuals. It is thought that embryologic development of the knee resulted in three distinct compartments, in which plicae became remnants of those compartments. However, a study by Ogata and Uhthoff suggests that distinct compartmental changes do not occur and that plicae formed as a consequence of joint space development. Normally, the medial synovial plica glides over the anteromedial aspect of the medial femoral condyle during flexion and extension of the knee. Generally, this gliding motion does not result in any symptoms due to the high viscosity of the synovial fluid. Irritation of the medial plica and occur males and females, and typically int the younger indviduals involved with repetitive activities (i.e. rowing, swimming, cycling, and basketball commonly associated). Congenital: the presence of a large medial plica can extend over the medial facet of the trochlea, resulting in impingement and irritation. Inflammation: the inflammatory state of the plica can cause pain, and chronic conditions can lead to fibrotic tissues. the resultant thickened plica can lead to cartilaginous impingement and condromalacia. Trauma: a traumatic incidence may have occurred months-years prior to symptoms that resulted in medial plica syndrome. Multiple surgeries: numerous surgeries to the knee joint can result in surrounding tissue changes that can irritate the medial plica. Medial plica syndrome can also occur secondary to other conditions such as arthritis, meniscal tears, other knee pathologies. Physical Exam: pain rolling plica fold tissue over anteromedial knees, tight hamstrings, and a palpable painful cord may be present but not typical. Examine knee flexion to see if medial femoral condyle or medial facet of patella is in contact with the knee. In addition, administer the lateral stress test to rule out ligamentous injuries. Mediopatellar plica test (MPP): The patient is in supine with the knee flexed to 30 degrees. The test is positive when accessary movement of the patella medially elicits the patient's pain. 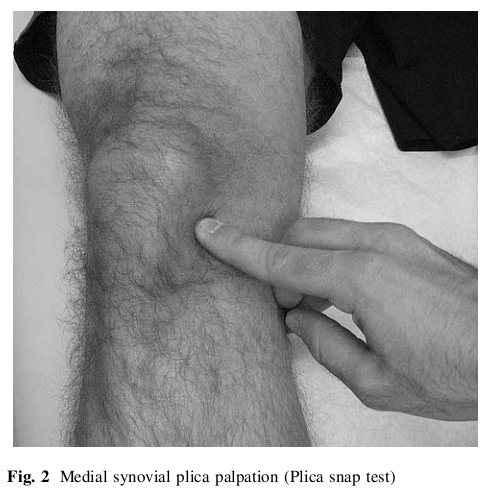 Plica Snap Test (Video 1): palpation of the medial plica (between the medial border of the patella and medial adductor region of the medial femoral condyle) (Figure 2). It is critical to have the patient relax (which is usually in supine) while palpating the medial synovial plica. Compare the pain to the contralateral knee and see if it reproduces their symptoms. Plica examination: The surgeon can evaluate the width, thickness, color, vascularity, and tension of the plica. Imaging: An MRI can be obtained, but a dynamic sonography has good sensitivity and specificity. It is recommended to perform a standing AP, lateral, and 45 degrees patellar sunrise (axial) radiographs of knee to rule out other sources of pathology. Gold standard: Knee arthroscopy, but can cause further irritation and scarring of the medial synovial plica. Griffith CJ, LaPrade RF. Medial plica irritation: diagnosis and treatment. Curr Rev Musculoskelet Med. 2008;1(1):55. Studies suggests that non-operative treatment of medial plica syndrome is successful within 6-8 weeks of a treatment program. Griffith CJ, LaPrade RF. Medial plica irritation: diagnosis and treatment. Curr Rev Musculoskelet Med. 2008;1(1):53-60. Dupont JY. Synovial plicae of the knee: controversies and review. Clin Sports Med 1997;16:87-122. Paczesny L, Kruczynski J. Medial plica syndrome of the knee: diagnosis with dynamic sonography. Radiology. 2009;251(2):439-446. Epub 2009 Mar 2010.